On Tuesday evening, the candidates in the Student Government Association’s presidential election participated in a public debate to discuss their platforms and planned impacts on campus. Four pairs of on-campus leaders took the stage: Antoine Fields and Darbi Welbaum, Kyler Gray and Madeline Mills, Ashley Stewart and Darwins Olcima and lastly Emilia Kosonen and Karen Caudillo. One thing that each of these four groups could similarly agree on was the amount of transparency that SGA provides with the student population. All of the candidates are advocating for a presidency that involves developing a better trust between SGA and the student population as a whole. Each of the candidates have gained insight into student life through their campus involvement which includes but is not limited to; Knights for Animal Rights, UCF Orientation Team, and various Greek lettered organizations. Candidates Kosonen and Caudillo chose to highlight “Integrity” when asked which principle of the UCF Creed a SGA president should embody. “We want to make sure that the university is doing things with integrity,” Kosonen said. Kosonen and Caudillo were referring to the university’s recent investigation into misallocation of funds for the construction of Trevor Colbourn Hall. However, this sentiment about moving truthfully is expressed by the other candidates, as they all make statements regarding plans to publicize the budgets of SGA if elected. 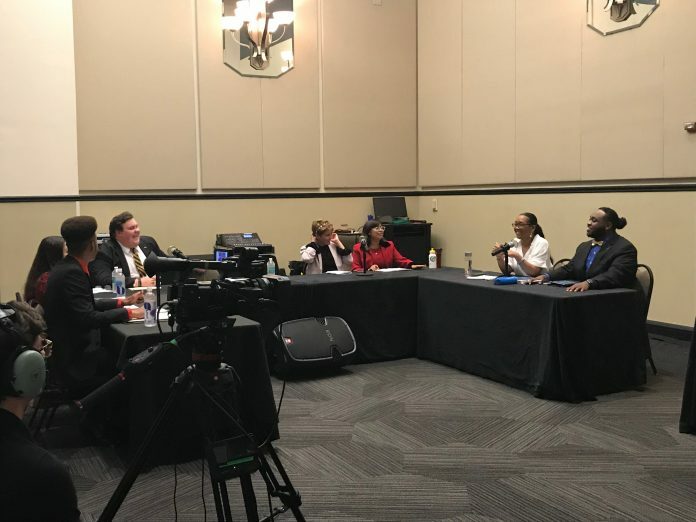 Candidates Grey and Murray did not leave any room for doubt regarding their sympathy and understanding of what students have to endure outside of SGA. Murray explained her financial struggles as a student of UCF. Candidates even said that they would find ways to connect with graduate students and those who attend the downtown campus of UCF. Candidates Ashley Stewart and Darwins Olcima are not alone in their sentiment of giving students “A seat at the table” in this election. These candidates said they will serve their academic and UCF communities wholeheartedly if they are elected into office. “Our mission is to create a united campus culture, that is inclusive, collaborative and diverse so that students and teachers can reach for the stars,” Gray said. Each of the candidates, if elected, said they want to work toward making UCF the best environment for all students and faculty.